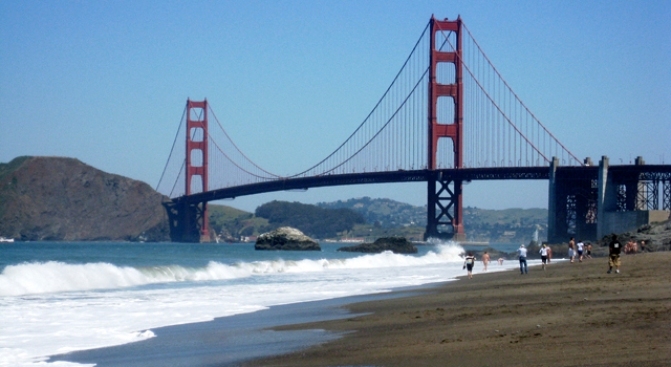 San Francisco's Baker Beach is not as clean as some experts say it should be. A pair of San Francisco beaches are getting low marks in a new study on the nation's healthiest beaches. In a list of the country's 200 most popular beaches, the Natural Resource Defense Council scored San Francisco's Ocean Beach and Baker Beach two stars each out of a possible five. The group based its rankings on water quality, monitoring frequency and public notifications. It says California beaches experienced 4,100 days of closures or advisories last year because of contamination. The biggest sources of harmful bacteria were dirty storm water and sewage overflows. At the same time, the report found a 13 percent drop in the number of closures from 2007 to 2008. NRDC says that could be a result of the budget crisis, which has forced California to cut back water monitoring. The group says monitoring at Baker Beach and Ocean beach was only done a couple days a week. The group recommends monitoring five days a week. "It is true that often if there is a contamination event if you don't have more frequent monitoring," said NRDC's Leila Monroe. "You may not know if you're swimming in human or animal waste." Dr. Mark Renneker, who's surfed Ocean Beach for 30 years, says even the current monitoring doesn't account for some of the naturally occurring toxins that show up in the waters of Ocean Beach. "Because they only chose two bacterial species to monitor," he said. "Both of which aren't particularly dangerous, it really doesn't quite reveal the extent of the problem." But some surfers didn't seem to think there was much of a water quality problem at Ocean Beach. Andy Olive who surfs the beach twice a day, says aside from an occasional ear infection, he hasn't had any health problems. "I'm worried more about getting a hangover than getting an illness from surfing here," he said. Laguna Beach-Main Beach, Bolas Chica State Beach in Huntington Beach, and Newport beach are among the list of California beaches earning five stars. Also in the Bay Area, Stinson Beach earned three stars.